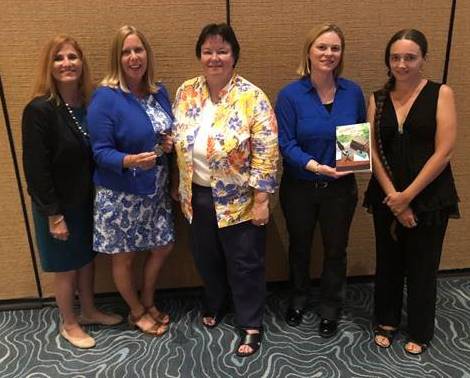 A book co-authored by Palm Beach State College employees Janet DeVries Naughton and Dr. Ginger Pedersen has received a silver medal from the Florida Authors and Publishers Association. Naughton, a librarian and associate professor on the Lake Worth campus, and Pedersen, vice president of information services, won the President’s Book Award in the Florida Adult Non-Fiction category for “Overdue in Paradise: The Library History of Palm Beach County.” They shared the award with co-authors Graham Brunk, Shellie Labell and Rosa Sophia. FAPA presented the awards at its annual President’s Book Awards Banquet held earlier this month at the Hilton Orlando Buena Vista Palace in Lake Buena Vista, Fla. While hosted by FAPA, the national award is open to authors around the country. This year’s awards were open to books published between 2017 and 2018. Judges are librarians, educators and publishing professionals. Overdue in Paradise is a non-fiction, 278-page book published by Palmango Press which traces the history and development of Palm Beach County’s public, academic and specialized libraries that developed their own distinctive collections, enriching the lives of residents since Florida’s earliest pioneer days. The Florida Authors & Publishers Association is an organization for authors, publishers, illustrators, editors, printers and other professionals involved in the publishing industry. It focuses on providing the highest quality of information, resources and professional development to members and others interested in the writing and publishing profession. Congratulations to Janet and Dr. Pedersen! Congratulations Professor Naughton and Dr. Pedersen! These are the educators who put student-centered learning experience that transform lives and strengthen our community in action! Congratulatons! But did I some more detailed description of the content?